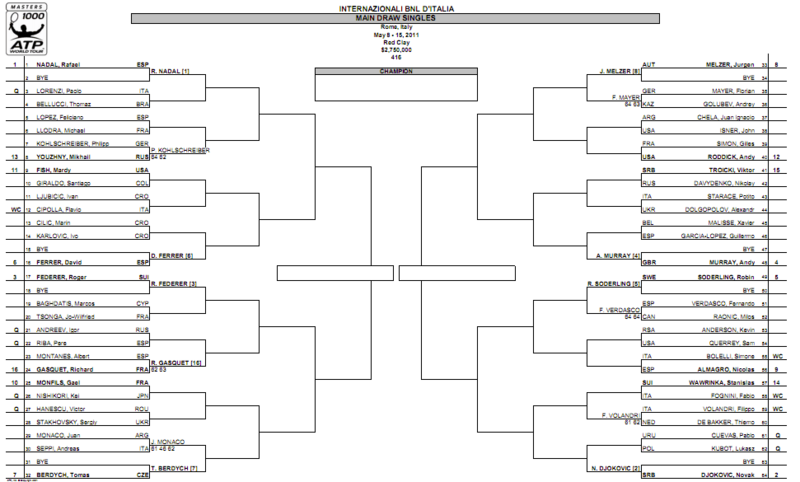 The ATP World Tour shifts to Italy this week for the Rome Masters. The draw is already out and play starts tomorrow. Roger’s seeded #3 and again in Rafa’s half of the draw. He’s got a tricky start as he faces the winner between Marcos Baghdatis and Jo-Wilfried Tsonga in his first match. If the draw plays out according to seeding, the Maestro could face Richard Gasquet in the third round and Tomas Berdych in the quarterfinals before a semifinal against Rafa Nadal. Click to enlarge the draw below. Look forward to more coverage in the week along with photos and video highlights.